This post is about the single phase motor winding resistance. 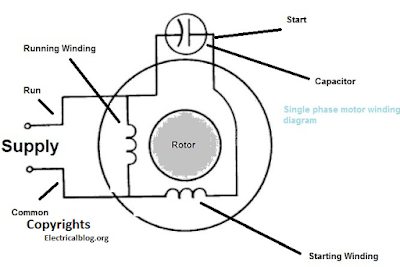 In this post you will learn about the single phase induction motor winding resistance. In the single phase induction motor we have two types of winding. In which one is called main winding also known with running winding. And 2nd winding is called auxiliary winding also known with starting winding. In the single phase motor, the main winding is make from thick wire which means that this winding will me low resistance then starting winding. The starting winding is made from the thin wire (SWG) which means that this wire will be high resistance then other one. For example if the main or running winding is made from the 21 SWG and its resistance is 2O ohms. And the starting winding is made from the 24 SWG wire. The resistance of this winding will be high. We know that the point in which the two winding connect together is called common point. And the main winding resistance is low then auxiliary winding. which means that the low resistance between common will be the run and high resistance with common will be start. So the supply will be goes to the common and run and capacitor will be connect between the run and start. 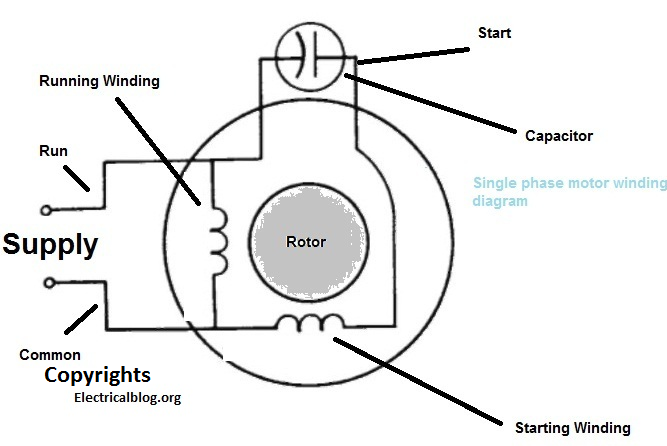 I hope know you will got some knowledge about single phase motor winding resistance and now you will be able to find about the main and auxiliary winding in single phase induction motor. However if you have any question about this post then you ask your question in the bellow comment section. Assalam o Alaikum Sikandar Bahi. Mein Electrical Technician ki job ka lia tiyari kar raha hon aap ki website say bahut faidah mil raha hai. On a simple motor with three leads there are a total of three combinations to measure. You measure the resistance of each of the three combinations. The highest measurements is the total resistance of both windings together in series. The next highest is the start winding. The lowest measurement of resistance is the run winding. The motor in the picture with the extra two wire for the start capacitor is a little more tricky, but if you disconnect the capacitor and measure the resistance of those two wires, it should be both the start and run together and is the total resistance of them both.